The winter of 2018 is starting off with a fabulous amount of snow. The skiing and snowshoeing has been terrific! We are happy to offer our guests free passes for beautiful Great Glen Trails, located at the base of Mount Washington in Pinkham Notch. These passes are good on weekdays, weekends and holidays, whenever you are able to come on up and enjoy the beautiful White Mountains! 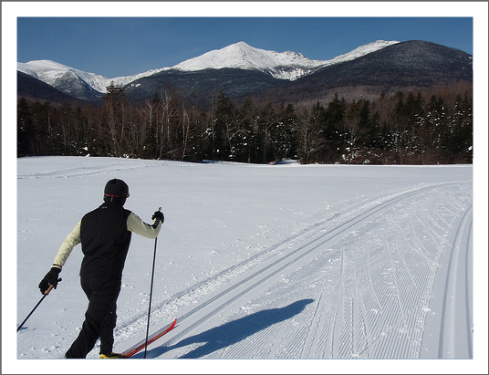 At Great Glen Trails you can glide on skis along gentle or challenging forest trails. You can snowshoe to a cozy cabin or discover the wilderness. You can slide downhill on a snow tube. You can explore the world above treeline at the 4.5 mile mark on the Mt. Washington Auto Road for a truly unforgettable experience aboard the SnowCoach. For the adventurer in you, the SnowCoach gives you the option to cross country ski, telemark ski or snowshoe down the Auto Road. The choice is up to you.